The twins spent the weekend before Mother’s Day with us while our daughter and son-in-law went away for the weekend. 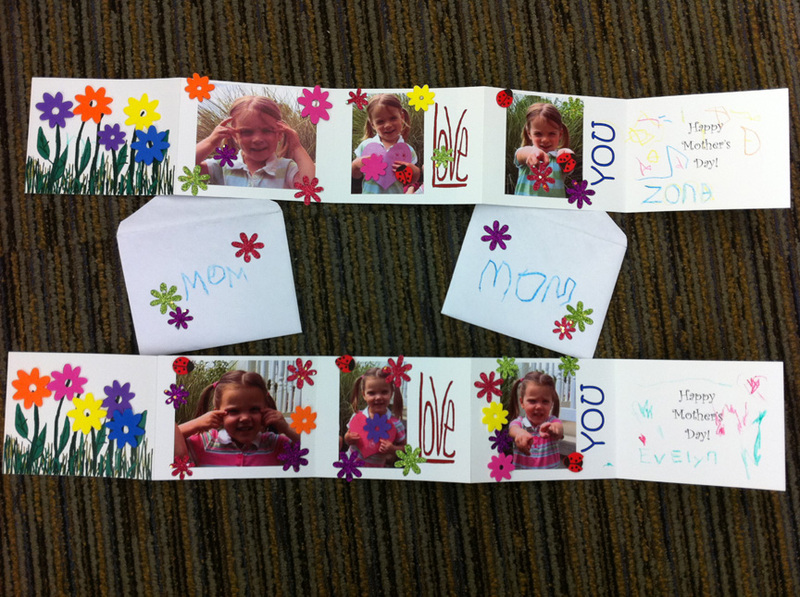 I thought I’d help the girls make cards for Mother’s Day. I took photos of them pointing to their eyes, a paper heart taped to their chests and the camera. Then I made an accordion card and added some text and headless flowers. The card wasn’t ready for them to take home (and I didn’t want them to know everything about it as one of them can’t keep a surprise) so I mailed it to our son-in-law. I had to talk to him first so he knew what to do with it when he got it. I included various flower and bug stickers for them to use to decorate the cards. I think they did a wonderful job! Their mom was so surprised! This entry was posted in art, paper crafts and tagged gift, paper, paper craft by Patti_is_knittinginflashes. Bookmark the permalink. What a wonderful idea. You are such a great grammy.